“We just fired our board… Well, actually we asked 14 of our 15 board members to resign.” That’s what a new client of mine told me on the first day of our new agreement. A significant funder of theirs told them that if they were serious about continuing to receive major funding from them, and if they were going to seek more significant funding from larger foundations in their region that they had to have a Board of Directors that was serious about taking them to the next level. My new client was savvy enough to know that the advice, as hard as it was to swallow, was correct. In the month that followed the ED had a face-to-face with each board member to explain the delicate and difficult situation. The reality is in any organization, corporation, nonprofit or church, that the leadership that got you to “point A” might not be the group that can take you to “point B”. Never Waste A Dramatic Situation. Telling someone that you fired your Board of Directors will get their attention! Don’t waste this opportunity. Be ready. Tell: a) why this was necessary (without throwing the old board under the bus), and b) what you’re doing about it. Seek legal counsel. Make sure you handle this properly. You may need governance changes to comply with the new reality. In this situation they changed the bylaws so they could have only 3 officers to create a “transition board” to “right the ship” for 12-18 months. Then they will recruit additional board members to go back up to 12-15. Manage the Message. Asking your board to resign could create the community perception that you’re in deep trouble. Stay ahead of the story. Inform Key Stakeholders. It’s been said that “a lie travels halfway around the world before the truth has a chance to put its pants on.” Talk to key donors, politicos, alumni, etc. to assure them that this was an important decision. Reshape the Message. The message you’ve been using to talk about your mission needs to be reshaped to reflect this new reality. Networking. In this case three new board members came via a “friend of a friend”. Connect with your most influential stakeholders, because they know other influencers who may want to help. Clear Expectations. As you recruit your new board have crystal clear expectations so they know what they’re saying yes to and for how long. Storming. Expect that there will be a period of “forming – storming – norming – performing”. You’re creating a new “recipe”. It will take some time for you to get to a high performing place. Raise the Bar. What worked in the past is not going to work in the future. Be clear about what you need in new leadership. People are attracted to courage, strength, clarity, risk-taking spirit. While this is challenging and risky ground, it is truly an opportunity to create a new story ending for your organization…one that is more meaningful, powerful, and filled with hope. What’s the risk that you know you need to take…for the sake of all involved? This is not a rehearsal. 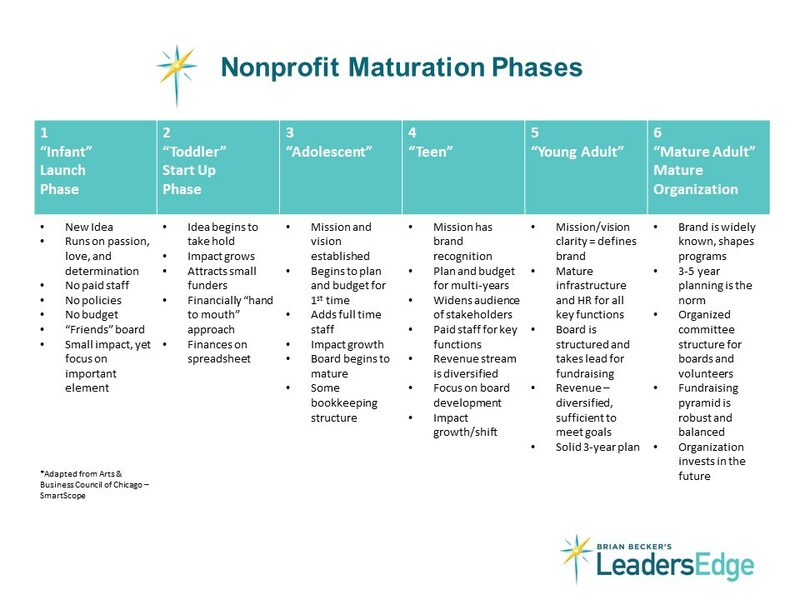 *The chart at the top is an adaptation of the Arts and Business Council of Chicago SmartScope approach to assessing the strength of a board.